Addicted to Nutralite? What's healthy about it? Are you one amongst those who are confused whether to opt for butter or the popular "Nutralite" that claims to be better than butter? If so, you definitely should give this a reading. Of late, I have been noticing many of my friends and extended family members opting for Nutralite over butter. When I ask them the reason of their choice, they are convinced that Nutralite is a healthier choice. The advertisement is so hyped that in every house, Nutralite seems to be their safest and healthiest choice. 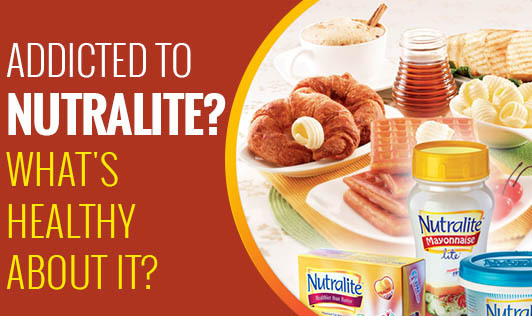 What is Nutralite and how is it different from butter? Nutralite is a form of margarine. Conventionally, margarines are obtained from the hydrogenation of cooking oils. The hydrogenation process adds trans-fats to the oil and has therefore, built a reputation of being unhealthy to the heart. However, today, some forms of margarines like Nutralite are prepared without undergoing the hydrogenation process. This way, the product has only minimum amounts of trans-fats in it or sometimes, is completely free of it. Nutralite has MUFA, PUFA and does have a lesser amount of saturated fat when compared to butter. It is cholesterol free as it is made from plant oils. So how different is butter? Butter, on the other hand, is derived from an animal source and so contains cholesterol. Butter has a comparatively higher amount of saturated fat. Organic butter does possess a certain amount of fat soluble vitamins like A,D,E and K. Butter is also known to possess certain health benefits like protection against cancer and improving the function of the digestive system. Butter has been a part of our diet for a very long time and we have carried childhood memories with it. With changing lifestyles, sedentary habits and an increased risk to develop heart diseases, butter has lost its place to other alternatives like Nutralite. Nutralite is made from edible vegetable oils that have undergone processing. The product contains several added antioxidants, Preservatives, flavouring, colours and sodium. This product does not mention the type of vegetable oil that has been used for it's production, and hence, it is difficult to report the possible health benefits from it other than it being low in cholesterol and saturated fat. Such margarine spreads are very popular in Australia, Newzealand and the U.S.A. In these countries, the content, the type of oil used etc. are very clearly mentioned and several Health Organizations do recommend this as a better choice over butter due to its lower risk for heart diseases. But, what about the Indian product "Nutralite"? To sum it up, on one side butter could be a choice for those who do not have a cholesterol problem or is generally having an active, healthy lifestyle. However, for most of us who lead a sedentary, busy lifestyle with unhealthy eating habits, Nutralite could be a safer bet to keep you healthy. The processing of this product and the effects it can have on the margarine may be a price to pay for this otherwise cholesterol-free choice! At the end of the day, whether it is butter or nutralite, both of them are forms of fat that need to be eaten in limited quantities only. Neither of them is going to give you health "benefits" if eaten in excess. So, eat in moderation and stay active to keep you healthy!